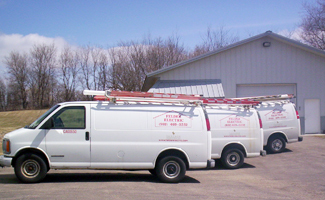 Felder Electric Inc. (Minnesota Class “A” Electrical Contractor Lic. # CA00650) opened up shop for residential and commercial business in Savage, Minn., in January 1990. Piloted by Minnesota-licensed Master Electrician Kent Felder, our bonded and insured electrical company continued to grow over the next four years in the Twin Cities metropolitan area because of our dedication to top-quality work and exceptional customer service. In December 1993, we moved to Lakeville, Minn., to make room for future business and growth. Following 11 successful years in the new location, Felder Electric ventured into computerized lighting and home automation systems after installing the wiring for a Vantage Controls home automation system in a 30,000-square-foot home in Wayzata, Minn. Soon, Felder went through additional training in Utah in 2004 to become one of the few installers and programmers of Vantage Controls home automation in Minnesota. Since then, we've been installing and programming homes in the Twin Cities metropolitan area with Vantage Controls and have installed many other brands of home automation and lighting systems as well. Felder Electric expanded its list of services in 2005 when we also became a licensed dealer and installer of Sony Home Theater Systems, equipping homes with flat-screen TVs and multiple-deck audio systems. Even after 20 years of business, any job — big or small — is a future masterpiece we put our heart and soul into. We take pride in our work and your satisfaction. So call on Felder Electric, your all-in-one electrical contractor. Kent Felder has been around the electrical business since his first job in construction in 1975. After graduating from high school in New Hampton, Iowa, Felder attended Northeast Iowa Community College in 1977 before moving to the Twin Cities in 1978. Once he took his first apprentice job with Master Electric Co., Inc., of Savage, Minn., in 1978, he also continued his education by going to night school at St. Paul Technical College for two years. After nearly four years as an apprentice, Felder began work for B & L Electric of Savage, Minn., in September 1982. By 1983, Felder passed the Minnesota State Board of Electricity exam for his Class “A” Journeyman Electrician’s license. Following five years as a journeyman electrician, Felder passed the state exam for his master electrician’s license in 1989 before starting up Felder Electric Inc., in January 1990. Have questions about our company? Need an estimate on a project? Call, fax or e-mail us. Interested in submitting some comments about Felder Electric? Download the eight-question PDF file below, fill it in with some remarks and email it back to kfelder@felderelectric.com. We appreciate your thoughts about our business. Thank you!